The Wake Maker is a torpedo-shaped bait made of knot free clear pine , with a free spinning blades at the back. The Wake Maker rides high in the water and can be ripped through the water with a jerking motion, or reeld in a steady manner, imitating a distressed bait fish floundering on top of the water. The Wake Maker was created with all fishing conditions taken into account. 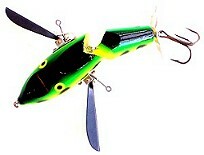 The chopping style blades can be slightly cupped to create more clatter and throw more water when fishing rough water. The blades can also be straightened a bit more for a subtle approach when fishing calmer water. 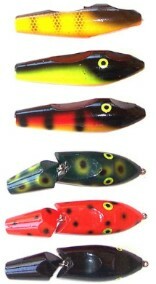 This a must have lure for serious anglers of Muskie, Pike, Stripers, and other saltwater gamefish! A jointed winged surface bait designed to be worked slow to trigger big fish. This bait also comes with a small propeller blade on the rear to create extra noise and vibration. Quality Mustad hooks and fish catching colors make this a must for every box. 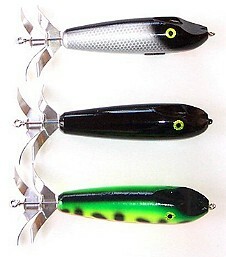 Mike's Creeper is a winged surface bait similar to the Creepin Hawg but with out a joint. This bait creates a lot of action and noise as it wobbles through the water resulting in violent strikes. An old favorite of most fisherman. this surface bait is built with quality through out. Strong Mustad hooks, through wire constrcution and stainless stell propeller. This bait has been proven effective day and night. Muskie Fishing Lures and Musky Fishing Tackle from Bobbie Bait. We put the musky in muskie fishing!